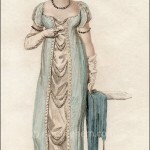 Ackermann’s Repository of Arts, April 1812. This dress, or at least this print, really reveals the model’s figure! 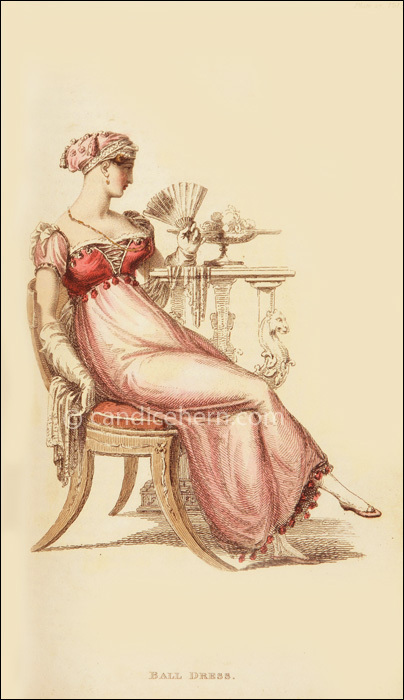 I love how Regency models are not the super-skinny girls we see in today’s magazines. 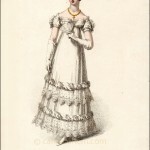 I know that some contemporary commentators felt that Regency fashion was much TOO revealing. 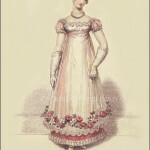 I suspect those people would have cringed at this print, where there is little left to the imagination below the waist! It’s a very international ensemble: Circassian robe, Spanish sleeves, Spartan head-dress. Love the ball-fringe at the hem and waist! The hat is called a helmet, which only means that it has no brim. Though it resembles a turban, it has more structure.